This week’s post reviews Fall 2018 fertilizer prices and the upturn in prices in recent months. Given current soybean prices, many producers will consider planting additional acres of corn, wheat, and cotton in 2019. While final Spring 2019 planting decisions are months away, fertilizer, and especially nitrogen, are a significant share of the crop budgets for these crops. This week’s post reviews current fertilizer prices and the upturn in prices in recent months. Figure 1 shows fertilizer prices reported by the USDA for Illinois. For most products, prices in September were higher than in the spring (April through May). Urea and DAP prices have both increased 6% in recent months. 28% liquid nitrogen and potash prices are also higher, up 2%. Anhydrous ammonia prices, so far, have been contrarian and turned lower since spring, down 4%. Figure 1. Reported Fertilizer Prices in Illinois, Select Products. April-May 2018 and Sept. 2018. Data Source: USDA. It is worth noting that DAP and potash prices have been on an upward trend over the last few years (Figures 2 and 3). DAP prices reached lows around $425 per ton in late 2016 and throughout 2017. Recently, prices have exceeded $500 per ton. Potash prices are currently above $350 per ton, the highest since late 2015. Figure 2. Reported DAP Prices in Illinois, Jan. 2015 to Sept. 2018. Data Source: USDA. Figure 3. Reported Potash Prices in Illinois, Jan. 2015 to Sept. 2018. Data Source: USDA. While most fertilizer prices have turned higher, anhydrous ammonia has trended lower since spring. This warrants a close look at nitrogen prices. Figure 4 and 5 shows prices of anhydrous ammonia and urea since 2015. Remember last fall anhydrous ammonia prices briefly fell to $400 per ton (a 20% drop) before returned to more than $500 per ton in early 2018. This year, the headline story in nitrogen has been urea. After spending most of 2018 at nearly $360 per ton, urea prices recently climbed to $390 per ton. This is the highest observation in more than two years, and well above the earlier lows of $300 per ton. Recent price trends have resulted in urea being historically high priced relative to anhydrous ammonia. Figure 6 shows this price relationship between urea and anhydrous ammonia. More specifically, the data are urea prices divided by anhydrous ammonia prices, on cost per pound of nitrogen basis. Over the data series, the urea/anhydrous ammonia price relationship is, on average, 1.21. In other words, the price of a pound of nitrogen from urea is typically 1.21 times that of the price from anhydrous ammonia. This spring, the price relationship, at 1.24, was very close to the long-run average. Currently, the price relations is at 1.37. This is to say current urea prices are above the average relative price (relative to anhydrous ammonia). Producers that have the option of using different sources of nitrogen might find anhydrous ammonia more attractive at current prices. Historically, an uptick in the price relationship is typically short-lived. This is to say that it’s not clear how long urea will be relatively higher-priced. The price relationship could change with urea prices falling, or anhydrous ammonia prices increasing. Figure 4. Reported Anhydrous Ammonia Prices in Illinois, Jan. 2015 to Sept. 2018. Data Source: USDA. Figure 5. Reported Urea Prices in Illinois, Jan. 2015 to Sept. 2018. Data Source: USDA. Figure 6. Urea Price Relative to Anhydrous Ammonia, on a $/lb. of Nitrogen Basis. Jan. 2010 to Sept. 2018. Data Source: USDA. As producers beginning to think about 2019 planting decisions, fertilizer prices will soon be on everyone’s mind. Since Spring 2018, fertilizer prices have mostly turned higher. Urea and DAP have increased 6%, while anhydrous ammonia prices have turned lower. For nitrogen, the recent jump in urea prices has pushed the price relationship with anhydrous ammonia above the long-run average ratio. This is to say that, relative to anhydrous ammonia, urea prices are historically high. At a higher level, fertilizer prices have recovered from eariler lows. 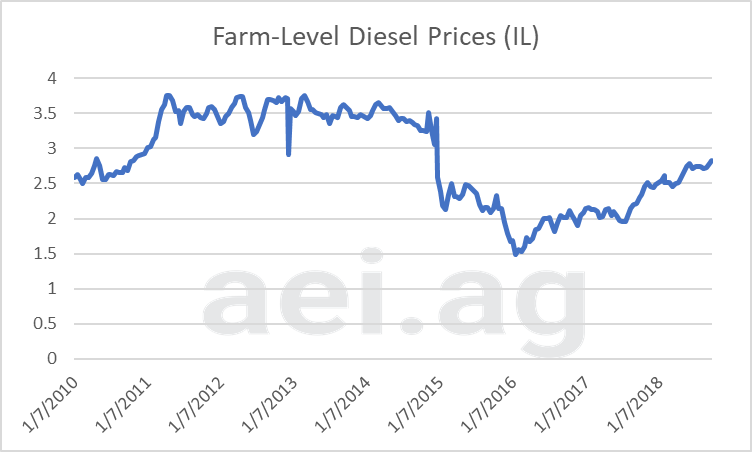 Beyond fertilizer, even farm-level diesel prices have recovered. While lower costs of production have been a critical improvement in the farm economy since 2014, looking ahead, the expectations of reduced fertilizer prices may be behind us.